Ali Baba’s Liquor and Wine is now open in Long Lake! Located on Tupper Road next to Lake Eaton Campground, this fully stocked store has a variety of well-known wines and liquors, in addition to a varied selection of new products to try. Special orders are welcome! Stop in or call #(518) 624-2020 or #(518) 955-4451 for store hours and information. On Saturday, September 17th, 2011 at 7:30pm the Town of Long Lake will be presenting Babik Jazz Group at the Long Lake Town Hall. 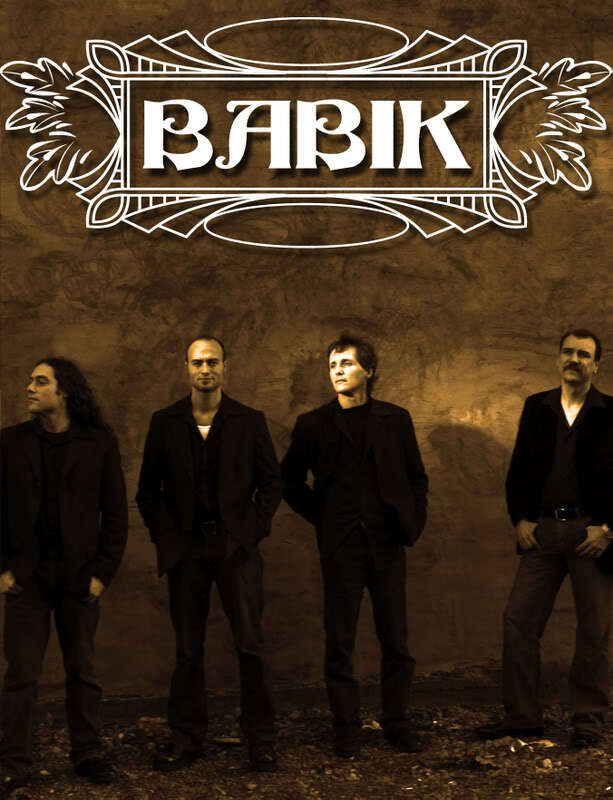 Babik (pronounced Bah-Beek) is a progressive Gypsy Jazz band inspired by the legendary guitarist Django Reinhardt. One of those rare musical ensembles that can truly reach across generational and stylistic lines to create a fan base that is as diverse as their musical influences. At their concerts it is not uncommon to see a white-haired 75 year-old grandmother dancing next to a purple-haired 20-something. Babik has the ability to bridge passionate jaw-dropping virtuosity, with a rare toe-tapping danceability that keeps its audiences enthusiastically engaged. The group’s ability to connect is evident in the way crowds clamber to clap, dance, and cheer along with nearly every performance. Since forming in 2005, Babik has enjoyed both commercial and artistic success. All four members (Stuart Fuchs-Lead Guitar, Geoffrey Fitzhugh Perry-Violin, Joshua Assad-Rhythm Guitar, Kevin O’Brien-Upright Bass) are full time professional musicians, and the success of their partnership, both on and off stage, shows in their lighthearted improvisational performances. Babik stays busy performing over 150 shows a year at concert halls and festivals, in addition to facilitating educational programs & improvisation workshops at high schools and colleges. In March of 2008, Babik worked with arranger Brent Havens (creator of orchestral programs of Queen, Led Zeppelin, The Doors) to create the first ever orchestral program of the music of Django Reinhardt, which was performed with the Buffalo Philharmonic Orchestra to an audience of thousands. Babik has even performed with the contemporary dance troupe Configuration Dance in a tightly choreographed theatrical show. Their hometown of Buffalo, N.Y. has awarded them “Best Jazz Band” by two different magazines for three years in a row. Their first release, “Pronounced Bah-Beek”, broke Western New York sales records at two area retailers, and the Buffalo News calls Babik “One of the Hottest Bands in Buffalo”—high praise from a town that launched The Goo-Goo Dolls, Ani DiFranco, Rick James, Spyro Gyra, and Soulive. With their latest release, “American Gypsy”, the band showcases ten original compositions and three standards that both honor the roots of Gypsy Jazz while exploring a wide range of styles such as Jazz-fusion, Klezmer, World and Latin Music. The result is an amazingly coherent, expansive, and ambitious vision of Gypsy Jazz that will excite jazz and music lovers alike. Tickets will be available at the door. $12.00 for adults and kids under 10 are free. This concert is made possible with public funds from the New York State Council of the Arts Decentralization Regrant Program. In Hamilton County the Decentralization Program is administered by the Adirondack Lakes Center for the Arts in Blue Mountain Lake. On September 30th through October 1st, the Town of Long Lake will be hosting the 2nd Annual Adirondack Affair Weekend with soap opera actresses two-time Emmy winner, Martha Byrne, best known as Lily Snyder from As The World Turns and Emmy-nominated Ellen Dolan, best known as Margo Hughes, As the World Turns. Friday Night features a VIP welcome cocktail reception and a Cabaret Performance at an area Long Lake Business to be announced. Martha with two fans Megan & Jamie! Saturday will be a day of rogue video production featuring participants in this unique weekend themed “Shooting on Location.” Scripted material developed specifically for Adirondack Affair will follow the story of the fictional Duryea Family. Grace Duryea (Martha Byrne) has returned to the quiet burg of Long Lake after the death of her father. She has arrived for the reading of his will and stands to inherit vast tracts of land, properties and businesses vital to the survival of the local economy. Charlotte, played by Ellen Dolan, will be on alert to the arrival of Grace Duryea, protecting secrets of the past that could change their lives forever. The two women have never met before, but sparks are sure to fly when Grace arrives at her father’s estate. The story of Grace and Charlotte will follow our guest actors and Adirondack Affair participants on a journey from learning scripted material, camera blocking, to live video taping. Scenes will be shot in and around Long Lake area businesses to highlight local actors and showcase the beauty of Long Lake. All levels of acting are welcome and encouraged to attend this unique once in a lifetime opportunity. The scenes will be uploaded, with permission, to youtube and if time allows there will be a viewing of the rough material shown on Saturday night to the participants. Don’t want to act? Participants are welcome to follow the production and watch our actresses work. Most recently Martha Byrne, co-created and executive produced, Gotham The Series, which was nominated for an Emmy this year. Martha has also appeared on General Hospital and written for the daytime drama The Bold and The Beautiful and executive produced a short film, Bye Bye Sally, featuring actress Malin Ackerman. Ellen Dolan has been very active with the Workshop Theater Company in New York City and is currently starring in the Cape May Stage Production, Steel Magnolias, running through September 10. Ellen Dolan plays the role of Truvy, a role played by Dolly Parton in the 1989 film adaptation. In addition to playing Margo Hughes, Ellen Dolan originated the role of Maureen Reardon on Guiding Light and has appeared on Law and Order Special Victims Unit and has recently worked on two films, Southside and Molly’s Girl. For more information check out www.adirondackaffair.com Adirondack Affair or call 518-624-3077 Sign up today! Total weekend event package is $50 includes VIP reception, Cabaret Performance and Shooting on Location. 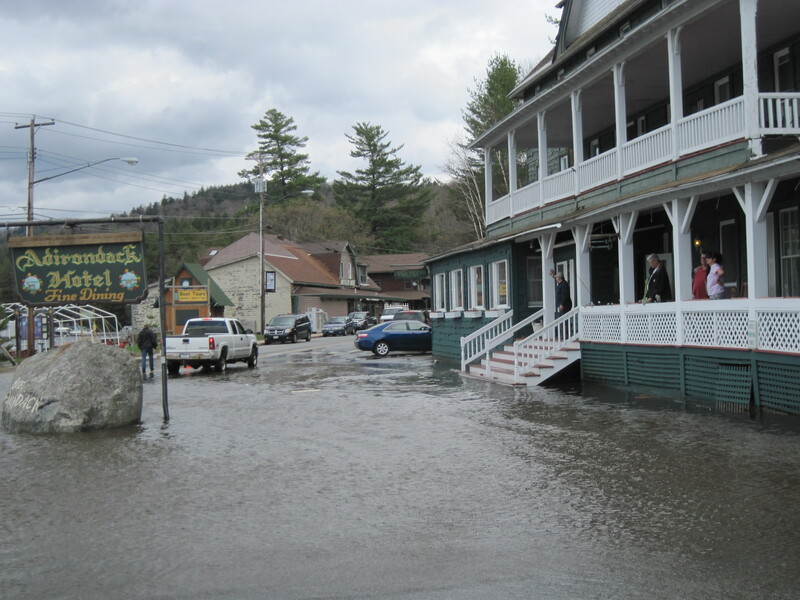 Friends of the Adirondack Hotel, will hold a fund-raiser Sept. 24 to help pay for fixing flood damage at the historic structure. 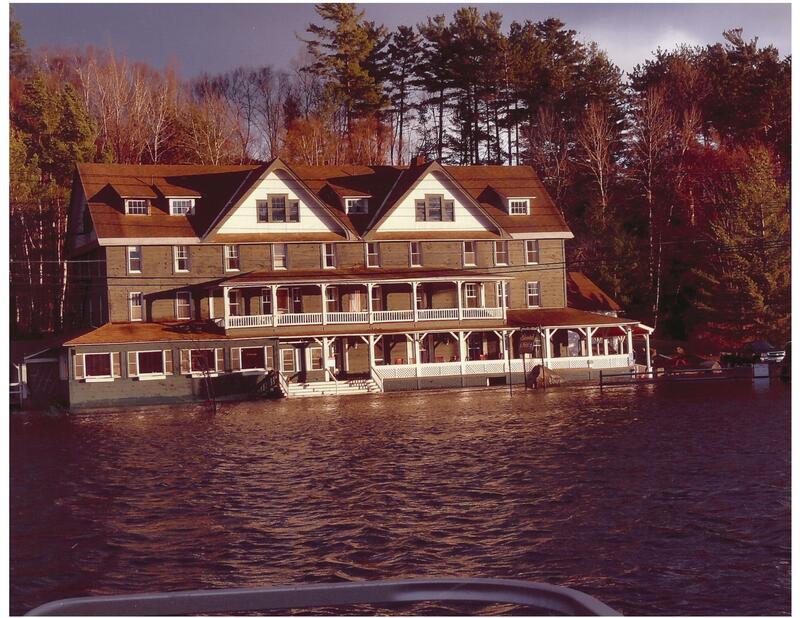 The hotel was inundated during last spring’s flooding, when the waters of Long Lake rose to the third step of the front porch, over 18 feet above normal summer levels. The Hotels’ boilers, front porch, parking lot and more were extensively damaged. 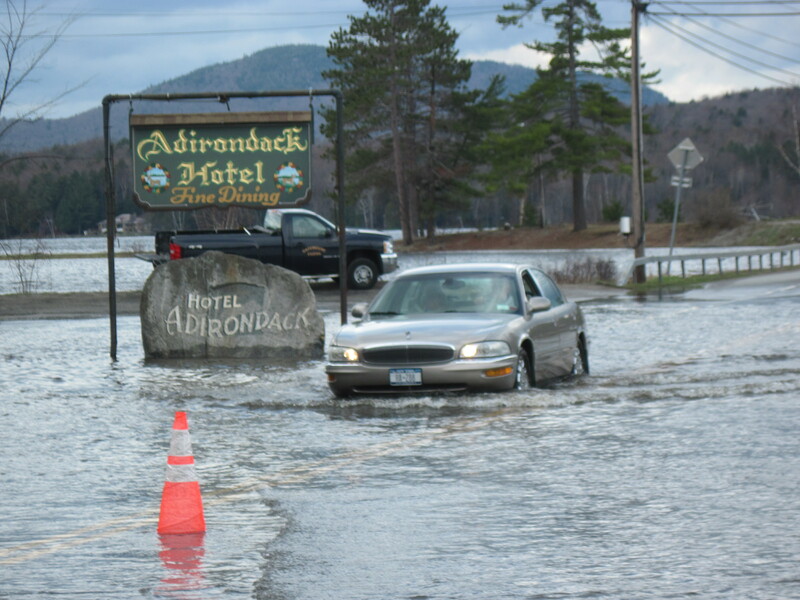 Adirondack Hotel Flood Relief will run from 2 p.m. Saturday to 2 a.m. Sunday with live music, a silent auction, food and t-shirts. T-shirts are available now at the hotel’s gift shop and tap room. 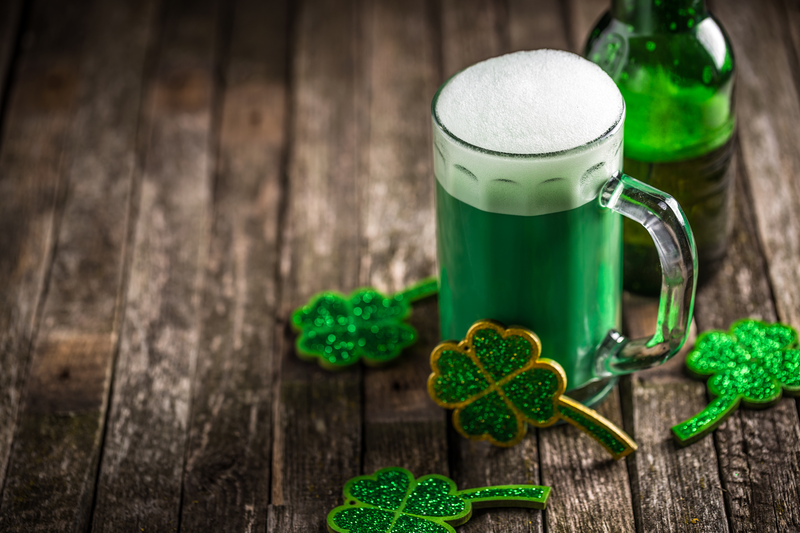 Tickets at $30 each / $50 per couple may be bought beforehand at Helms Village Store, Natural Beauty, Shear Images and the Adirondack Hotel in Long Lake; The Bear Trap in Indian Lake; or at the door. 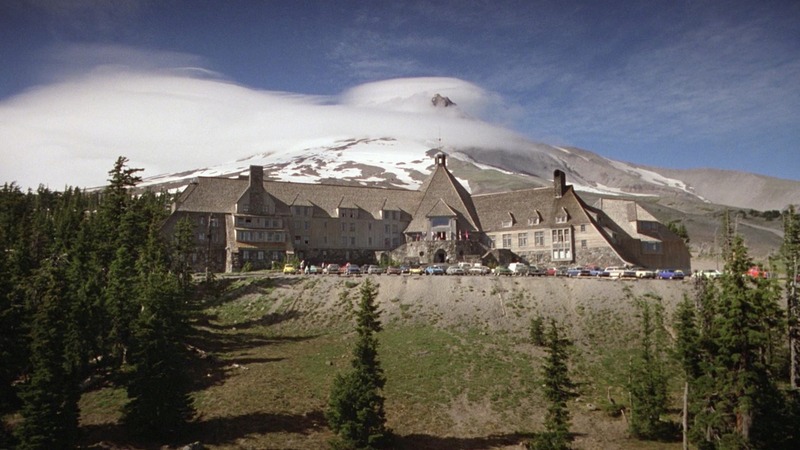 The hotel is open year-round, employing over 30 people. Flood insurance will not cover the damages because the water did not reach the first floor. The Adirondack Hotel has lots of history. Read on. April, 2011, The 100 Year Flood occurred. The hotel closed until power was restored a few days later. The cellar was flooded and boilers were ruined as was the food in coolers which were no longer cool. The Army National Guard and Long Lake’s Volunteer Firemen provided pumps to help clear the cellar of water. The pumps were finally turned off at the end of May. The cellar is now dry. There was flood insurance, but, with a $50,000 deductible. The only things covered by insurance were the cellar and the boilers and those costs came nowhere near $50,000. Damage to the driveway, kitchen floor, veranda, loss of business etc. was not eligible for coverage. Total damage amounted to $130,000. As of today, Carol is still at the helm with her husband Carmine Inserra and her god-daughter, Margie, as Manager. On Saturday, September 24, 2011, friends of the hotel plan a fundraiser to help defray some of the cost from the flood not covered by insurance. The ultimate goal – to keep the hotel alive, vibrant and employing people year round in Long Lake. US Senator’s Chuck Schumer and Kirsten Gillibrand stopped by Long Lake Central School on Friday, August 12th as part of a whirlwind tour of the Adirondack North Country Region to meet with leaders from around the Adirondacks and to engage in conversation about jobs and the most vital issues facing Adirondack residents today. On tap for the structured panel discussion included William Farber, Chairman of the Hamilton County Board of Supervisors, Brian Towers, President of the Adirondack Association of Towns and Villages, Mark Brand, Superintendent of Indian Lake Central School, Kate Fish, Executive Director of ANCA, Garry Douglas, President and CEO of the North Country Chamber of Commerce, and Ann Melious, Director of Economic Development and Tourism for Hamilton County. Kirsten Gillibrand arrived in the room first, shook everyone’s hand and made light of the fact that Chuck was still out in the hallway talking. Gillibrand opened up the discussion with her appreciation for everyone coming out to meet with them and cited the most important issue of the day: jobs. Senator Schumer entered the room with Bill Farber and greeted everyone and remarked on the beauty of the area, the bustle of the town, the great weather and then the panel got down to business. Bill Farber led the meeting, thanked Long Lake Central School for hosting the event then and called on the panelists to share their insights. Brian Towers spoke first and gave both US Senators copies of the APRAP study. The report is the result of a two-year research effort by and for the communities of the Adirondack Park to provide a data-rich, factual baseline for discussion and planning of park issues at both the local and regional levels. Brian Towers touched upon the human desire of people who want to live in the Adirondack region because of the natural beauty, water, quality of life, small schools, but the lack of jobs has bled the region dry. He listed several ideas that included attracting innovative thinkers in rural development to the region, and the need to create and develop loan funds to support infrastructure. Other ideas included: the possibility of carbon credits, developing family friendly jobs focusing on biomass and to foster a way to encourage and reward private investment. Mark Brand reminded Senator Schumer of previous visits to the Indian Lake Central School. Schumer remembered his visit fondly as he had a school lunch featuring fish sticks. After a moment of levity Mark Brand spoke about the schools in the immediate area. He emphasized the answer is not to consolidate schools, but to create opportunities out of challenges. Model the regional school districts as the Newcomb, NY school district has done, and to seek federal help to revise immigration laws to make it easier for smaller communities and public schools to host foreign students and limit unfunded mandates. Kate Fish spoke about the Common Ground Alliance’s successful meeting held in July (in Long Lake at Mt. Sabattis) which is a cross-section of people in the Adirondacks with differing views. This year’s event the Common Ground participants were asked to rank potential workable ways to model a future for park residents and the overall consensus was to work on the model for the Sustainable Life, but for that to succeed it was vital to have broadband available in the region. Garry Douglas outlined the potential revitalization of the historical train corridor route between Utica and Lake Placid with an emphasis on connecting to Tupper Lake. Douglas also mentioned the possibility of developing it as a recreational corridor, clarifying that trains and a viable recreation corridor for hiking, biking and snowmobiling would not be exclusive of the other. Both Kate Fish and Garry Douglas touched upon the importance of broadband to the region and the topic elicited a big reaction and much interest from both Schumer and Gillibrand. The panel discussion veered off course so the senators could clarify the needs of the area. Where broadband is available now? Where wireless is available and if one was more viable to the region than the other depending on the area it was serving. In Long Lake cell phone service is available from AT&T only and not Verizon. Long Lake does have DSL available and it is serviced by Frontier Communications. At this time the Town of Long Lake has plans for two wi-fi hot spots at both Mt. Sabattis Pavilion and the Long Lake Town Hall. Plans for implementation and timeline have not been released yet. The broadband discussion emphasized the need for money to serve the last mile of broadband. The hardest challenge is the connection from a main hub to the local residents. Gillibrand is working on a farm bill and discussion on the agricultural committee is the consideration to put a requirement similar to the original telephone bill to make broadband service available and mandatory all across the country. Ann Melious from Hamilton County, NY spoke about the effort by the county to promote and attract younger families with children to move to the region. Hamilton County is starting a campaign to tap into what is most attractive about our area to live including: safety, scenery, sense of community, small schools and to encourage people to work from home. She sought support from the senators to consider the possibility of Hamilton County being part of a pilot program and model for rural communities across the nation. Time was short, the itinerary was tight and the Senators took some photos with guests at Long Lake Central School. Once photo ops were completed they continued on their North Country Tour. SARANAC LAKE – Both of New York’s U.S. senators will be in town Friday and will hold three events together, focused on economic issues. The first event will be at 9 a.m. at North Country Community College in Saranac Lake. Senators Kirsten Gillibrand and Charles Schumer are hosting a “Rural Care for Veterans Round Table” with representatives of Saranac Lake’s Veterans Administration clinic, St. Joseph’s Addiction Treatment and Recovery Centers, Homeward Bound Adirondacks and the state Department of Veterans Affairs. Then their schedule calls for them to be at the Adirondack Regional Airport in Lake Clear for another economic development roundtable at 12:15 p.m. This one will focus on the airport and on the growing biotech industry in Saranac Lake. Gillibrand also plans to visit Bombardier Transportation in Plattsburgh at 2:15 p.m. to announce her new agenda to create more advanced and high-tech manufacturing jobs, the cornerstone of which is her “Made in America” competitive grant program. She says advanced and high-tech manufacturing is growing despite heavy job losses in other manufacturing sectors in New York. Gillibrand’s last official visit to the area was in July 2010, when she held a forum with local officials and community leaders in Lake Placid. Schumer’s was in August 2010, when he visited Lake Placid and Tupper Lake to promote legislation designed to boost tourism. They also both vacationed in Lake Placid last August. Schumer has visited the area numerous times since his election in 1998. Gillibrand represented part of the Tri-Lakes area when she was a congresswoman for New York’s 20th District. Saranac Lake Mayor Clyde Rabideau, who has about 20 years of political experience here and in Plattsburgh, said he has never seen two U.S. senators in the same place at the same time. The closest he came, he said, was when Plattsburgh Air Force Base closed in the 1990s, when he was mayor of Plattsburgh. Sen. Alphonse D’Amato showed up, and Sen. Patrick Moynihan meant to but missed his flight. Expanding the biotech industry has been a major goal for Rabideau. He recently inked a deal bringing two biotech firms from Lake Placid to Saranac Lake and would like to see the area become a hub for the biotech industry. Sidney S. Whelan, Jr. will be presenting a lecture and slideshow on Arpad Gerster for the Long Lake Historical Society exhibition to be held on Friday, August 5th. The lecture will be a the Long Lake Town Hall at 7pm. Whelan will be discussing the history of Gerster based on his book Notes Collected in the Adirondacks 1895 & 1896, the Fishing and Hunting Diary with Insights of a Physician, Scholar, and Humanist, acclaimed by Bill McKibben, Nelson Bryant, and Nick Lyons, and many others. A surgeon who practiced at Mt. Sinai in New York City in the late 1890s and early 1900s, Dr. Arpad Gerster, Hungarian by birth, was also a sportsman, linguist, and an artist. 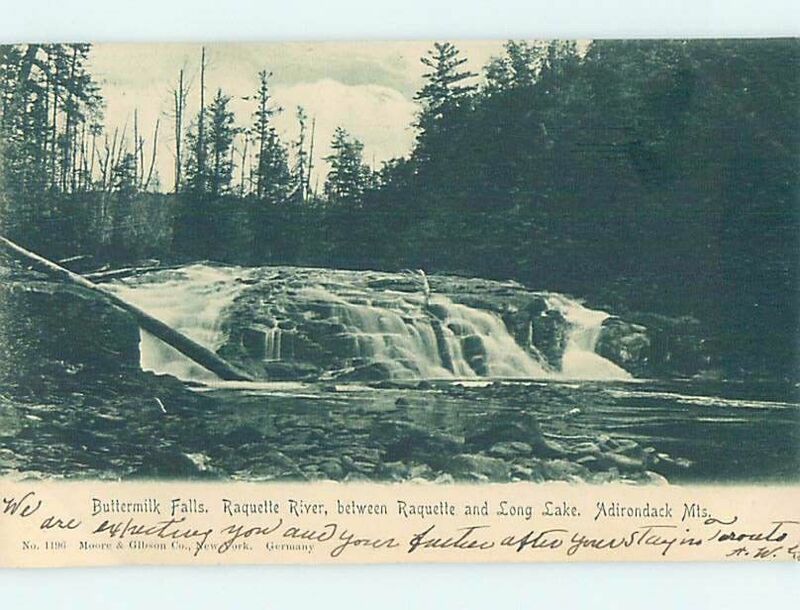 Both diaries chronicle his visits to the Adirondacks, where he had camps at Raquette Lake and later Long Lake. Gerster’s vivid, often humorous observations of nature and people, his delight in the outdoors, and his drawings and etchings offer a larger portrait of the Adirondack region in the age of William West Durant, Great Camps, railroads, and the beginning of the conservation movement. Illustrated with Gerster’s own work as well as maps of the region from the 1890s, the latest book contains an interview with Dr. John C. A. Gerster, Dr. Arpad Gerster’s son, and a detailed index covering both volumes. Mr. Whelan will have copies of the book available for sale at his lecture on Friday evening. In addition to Sidney’s lecture on Friday evening, the Historical Showcase will feature old photos of Camp St. Mary, Images of Long Lake men and women who have served in the military and a 100 year history of The Adirondack Hotel in photos. Saturday night at 7pm, Ray Smith will be presenting a slideshow. The Long Lake Historical Society Showcase will be at the Long Lake Town Hall Friday, August 5th 6pm, with lecture and slideshow at 7pm. It will be open on Saturday, August 6th from 1pm with a slideshow at 7pm and open on Sunday, August 7th from 1pm to 4pm. Admission is free and contributions are welcome. Call 624-5374 for more information.